Last year, CICF worked with a local agency, Smallbox, to train 36 representatives of different neighborhoods and population groups as ambassadors for their communities. Each ambassador conducted a listening tour to gather residents’ concerns, excitements and hopes. These conversations, along with national and regional data, have helped shape CICF’s commitment to dismantle barriers and build more pathways for everyone in the community to reach their full potential, no matter their place, race or identity. On this month’s episode of For Good, meet a few of the ambassadors and find out how their work is fundamentally transforming CICF’s goals and initiatives. Welcome to For Good, Central Indiana Community Foundation’s podcast highlighting stories about passion, purpose, and progress in Central Indiana. At CICF, we believe in opportunity and equity. We believe that our communities and neighborhoods are stronger because of our diversity, and we believe that, with innovation and boldness, Central Indiana can be a place where everyone can reach their full potential, no matter their place, race, or identity. This is our community and these are your stories. LIZ: I like to say we opened the doors and windows of the foundation and allowed the residents to actually become very engaged. Central Indiana Community Foundation is making a promise. Its new five-year strategic plan dismantles barriers and builds more pathways for everyone in our community to reach their full potential, no matter their place, race or identity. ALICIA: It’s important to us that we do things with the community and not to the community, so we wanted to make sure that we were listening to people all over Marion County and Hamilton County. CICF’s goals: Change systems, empower people and dismantle institutional racism, but the work of pursuing equity cannot be accomplished by any foundation working alone. ROB: We kind of went to the, you know, the people that we knew in the not-for-profit area and some neighborhood leaders that we knew, but then we said to them, ‘who do you know?’ It’s not that we don’t want you, a neighborhood leader, we want the insiders, the unknown grassroots leaders in your community. I would say we probably didn’t know 80% of the ambassadors that came to us. They were never on our radar screen before. CICF’s Vice-President for Development, Rob MacPherson, helped establish the CICF Ambassador Program. It proactively ensures that every day Central Indiana residents’ voices are heard in the foundation’s work. So residents from Haughville to the Far Eastside to Westfield and beyond were tapped to uncover and report on their neighborhood’s needs as well as the things that could help them thrive. ROB: We were hoping to find 20 people around the community that would be interested in, in doing this with us for a few weeks, and we ended up with almost twice that. 38 ambassadors ended up doing this for us. Ambassadors went through a day of training to hone their interview and empathy skills and then they hit the streets of their own communities. They went to neighborhood hangouts, talked to fellow students, stood in line at soup kitchens. One Uber driver even put a suggestion box in her car. Here’s Annie Smith. ANNIE: I am from the Far Eastside. I attend Mount Carmel Baptist Church. I was very strategic in the people that I chose to interview because I wanted to get a good cross-section from the Latino community on the Far Eastside, faith-based organization, and a city-county council representative, as well as youth within my church community. It was an emotional journey for Valerie Davis, an ambassador for the St. Clair neighborhood on the Near Eastside. VALERIE: We all in this neighborhood, we all want the same thing, and I was shocked and as a single mother and, I get, that’s how I get, choked up. Giving back is everything and you supposed to help the underserved and do something to make a difference. So it just put it into perspective that the people you step over on the sidewalk, you don’t know what issues they’re going through, you don’t know what, what’s in their mind or what their troubles are, but if you’d sit down and talk to ’em like I did, they want the same thing. They wanted [laughs] simple things. Just, to me, they said just peace of mind and a place of beauty that wasn’t spoiled, that they could just sit down and relax. Darrin Orr represents the Northeast Corridor. DARRIN: There was a common theme throughout the entire community, whether it was dealing with people who are re-entering our society or folks that were long-term residents, renters, or business owners. They all had a similar desire for education, communication, and connection. Beverly Beatrice, born and raised in Martindale-Brightwood was chosen as an ambassador for that neighborhood. BEVERLY: It gave me a chance to truly sit down and listen and not try to fix it, but just hear where they were coming from. Not at a place of need, but just at a place of wanting to share, ’cause no one needed anything. I went to them and asked questions and there was their voice being articulated and I was articulating it for them. If we have an opportunity to let other individuals know and understand who’s doing the funding across all of the Marion County area, I wanted to be a part of that, but I wanted to bring the voice of the community to be a part of that. To date, the ambassadors have processed a thousand points of data and anecdotal information, an overwhelming result that, coupled with research and best practices, is influencing how CICF views its work over the next several years. ROB: I think we can have true generational impact with this and move the needle in a bigger way than, than I think we have or, or even, you know, all of us collectively have in the charitable sector. LIZ: We learned that we tend as foundations to complicate the issues. So as our community investment staff, how do we align what we do in the community with those hopes and desires and dreams of the residents in those communities? Liz Tate is vice-president of community investment at CICF. It’s her job to leverage resources to help communities. LIZ: Foundations tend to come in with big ideas and quite frankly waste a lot of resources and I believe that the ambassadors are going to help us be smarter about how we invest in our community. ROB: I think we’re going to invest in partnership now with them. People in the Southwest corner of Indianapolis in Decatur township needed to decide what’s right for them, as did the people in Fishers and up in Sheridan and the northwest corner of, of Hamilton County. There isn’t a one size fits all and I think we’ve really, really learned that we’ve got to pay attention and listen to and co-invest with the neighborhood rather than to or for the neighborhood. ALICIA: And we had a request from the Edna Martin Christian Center. They wanted to use the materials out of our field report that the ambassadors were able to provide. So we are very excited that one of the benefits that we did not foresee was that maybe other communities may take some of this rich information and use it to help improve and stretch and enhance the work that they’re doing for communities. BRIAN: Is there anyone who would like to come up and share with us a, a moment of your learning or your experience? We would love it. Please, please, please. After a year of listening in their communities, ambassadors gathered in December to reflect and advocate for the future. ANNIE: The challenge I see now is that there’s some action taken, because people always are willing to tell you what the issues are. They’re also willing to give you solutions, but what people in this community need to see are action steps taken to address it. So that’s the challenge moving forward, and I think the ambassadors can play an important role as they are the voice of the people. The CICF ambassador program may have started as a one-year project, but with its success, CICF is finding ways to engage with ambassadors in other beneficial ways over the next five years. ROB: We’re going to stay in touch with them or we’re going to engage them as we implement the plan. We’re actually going to use them now as, as a feedback loop and as a direct connection into these neighborhoods and populations that we, we want to serve and, and look at this equal opportunity. 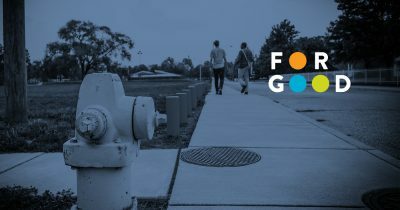 On this season of For Good, we too will be staying in touch with the ambassadors, traveling with them to get a closer look at these fascinating stories unfolding in Central Indiana neighborhoods. We are Central Indiana Community Foundation and you’ve been listening to For Good. If you liked what you heard today, we hope you’ll subscribe to For Good on your favorite podcast app and, while you’re there, don’t forget to leave us a review. Join us next month for more stories about passion, purpose, and progress in Central Indiana. For Good is brought to you by Central Indiana Community Foundation in partnership with WFYI Public Media. To learn more about how CICF is changing our corner of the world for the better, visit CICF.org. Thank you for listening. thank you to CICF for recognizing a need To gather the voice of the community and doing something with the information. it was a great experience and I look forward to the next steps! This effort sounds wonderful, I would be interested in hearing more about what insights were discovered. I would love to be a CICF AMBASSADOR!